Flourish Excel™ is the first step in building a concrete planted aquarium that will last for years to come. It is this idea the Seachem introduced a line of planted aquarium products that provide the aquarist with an easy way keep tropical plant aquariums. 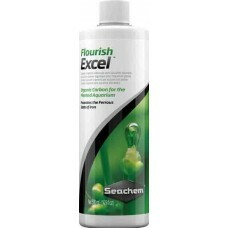 Flourish Excel™ is a source of bioavailable organic carbon. All plants require a source of carbon. This is typically obtained from CO2, but, may also be derived from simple organic compounds (such as photosynthetic intermediates). The use of either CO2 injection or Flourish Excel™ does not necessarily negate the use of the other. Because the processes of producing photosynthetic intermediates and building onto them occur simultaneously, one can derive a substantial benefit with the use of Flourish Excel™ either alone or in conjunction with CO2. The combination is particularly ideal for situations when continuing to add CO2 could result in dangerously low pH levels. Flourish Excel™ also has iron reducing properties which promote the ferrous state of iron (Fe+2), which is more easily utilized by plants than ferric iron (Fe+3). The reason plants need CO2 is to produce longer chain carbon compounds also known as photosynthetic intermediates. Photosynthetic intermediates includes compounds such as ribulose 1,5-bisphosphate, and 2-carboxy-3-keto-D-arabinitol 1,5 bisphosphate. Although the names are complicated, the structures are quite simple (5 carbon chains). Flourish Excel™ does not contain these specific compounds per se, but one that is quite similar. On initial use or after a major (> 40%) water change, use 1 capful (5 mL) for every 40 L (10 gallons*). Thereafter use 1 capful for every 200 L (50 gallons*) daily or every other day. Dosing may be slowly increased in high-growth aquariums. For smaller dosing please note that each cap thread is approximately 1 mL.